The Orongorongo Valley is a nearby place that I’ve overlooked quite a lot. In once sense it’s too close, which isn’t a fair way to judge somewhere. 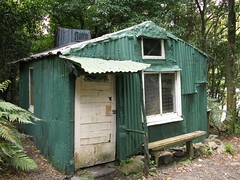 It’s also relatively popular, with roughly 100 locked private huts and batches dotted along the Orongorongo river. When I’ve visited in the past, I’ve not really felt as if I’ve been far away from anything at all. I spent last weekend there on my own, however, and enjoyed it. I was actually supposed to be going with some others into the Tararuas, but that arrangement fell apart a day or two before, and I doubt I’d have been able to go along with it anyway since I’ve been having some knee problems since arriving back in the country. I really didn’t want to do nothing, though, and made a last minute plan to walk into the Orongorongas from Catchpool Valley, stopping to camp at whatever point my knee decided it could go no further. This plan eventually led me to an ad-hoc campsite next to a river underneath Papatahi where I stayed for a night, before walking out roughly the way I’d come on the following morning. 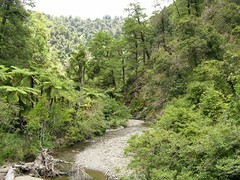 Location: Rimutaka Forest Park, Catchpool Valley road-end. 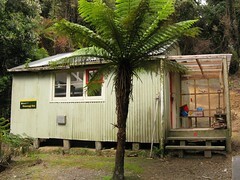 Huts visited: Baine Iti Hut (0 nights), Shamrock Hut (0 nights), Haurangi Hut (0 nights), and a heap of private lodges. Route: Catchpool Valley to the Orongorongo River, up the river to North Boulder Creek, camp in the creek below Papatahi, then back the same way. And thus it was that after a late start, I arrived at the Catchpool Valley car-park at about midday. I’ve been here before, but my first impression on the day of this entrance to the Rimutaka Range was that it might not have been a good idea with a dodgy knee. It’s probably by far the most popular entrance to the range, and the Orongorongo Track, which is the main route to the Orongorongo River, is hard enough on the legs that it might as well be cemented. A little over an hour later, though, I reached the main Orongorongo River, and walking on the sandy river rocks made things easier on my problem knee. 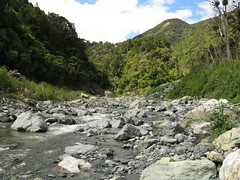 Many people were around during the sunny Saturday, especially near the junction of the main Orongorongo Track. This is probably a reflection of the accessibility and popularity of this area, and the numerous nearby places to stay, and so much the better to see everyone out and enjoying the place. The area is flooded with private batches, and most of them are concentrated in this part of the valley. They tend to be hidden in the trees and so besides the occasional hut poking out from the trees, their presence isn’t overbearing on a walk up the river bed. 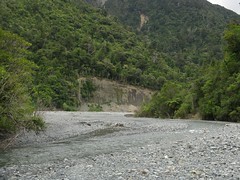 The bed of the Orongorongo River is very wide and braided. Most of the time it’s low and easy to walk along, but it’s still necessary to get wet feet. There’s a track along the western side somewhere for part of the way which is where many of the batches are hiding, but when the river floods it’s very possible to be trapped on the wrong side. This certainly wasn’t happening on Saturday, though. One of a pair of Paradise Ducks. A New Zealand Pipit (I think). Matthew’s Stream is the turning point for most people wanting to climb Mt Matthews, which at 941 metres is the highest peak in the range, so I suppose this would be as far up the Orongorongo River as many people go. It’s also the point at which private lodges seem to thin out a lot, and from here on things finally began to feel more remote, in a sense. I wasn’t walking along the track in the trees (I couldn’t see the point on such a nice day), but I think it’s about this point where that track stops. LINZ still considers there to be a track heading up the river, but as far as I can tell it’s effectively the same as the 4WD route up the river, even so far as the Department of Conservation marking the road with very occasional orange triangles, such as the route up to Shamrock Hut — one of the locked DOC huts to which I went for a quick look. If you’re planning to follow the “official” track and happen to lose it, the easiest thing to do is probably to ask yourself where a herd of rampaging elephants might go (or have been), and that’s most likely where you’ll find the 4WD route. In most cases there’s little need, though, because it’s a whopping big river bed and very difficult to get lost unless you happen to be looking for a very specific place along the edge. the entry to the water catchment. I continued up the river, and at about 3.45pm (roughly 3.5 hours from the Catchpool Valley carpark, though I suspect this is a fairly quick time by some standards), I found the point where the 4WD route more or less stops and the main marked DOC track heads up to Papatahi, eventually over to the Wairarapa in the route known as the Papatahi Crossing. Actually the road possibly continues further up the main river, but it’s not legal to continue without permission because it’s from here that the Orongorongo River emerges from one of Wellington’s main water catchment regions. Prior to leaving I’d had a plan in the back of my mind to look somewhere up there somewhere for a nice camp-side, based solely on the terrain shown on the map. I suppose now I know better. With lots of daylight, though, I kept walking further up North Boulder Creek, where the Papatahi Crossing route goes, and although the potential good campsites up that way seemed hard to come by, I managed to find a small patch of sandy rock that was reasonably flat and just large enough to pitch my fly. It’s probably been used for camping in the past. I made a note of it but with so much daylight left, I was thinking about heading up to Papatahi for a look. The final stage up to Papatahi. At 902 metres, Papatahi is the second highest peak in the range after Mt Matthews, and it seemed a shame to be so close and not visit. I made it as far as filling up my water bottle and preparing virtually everything, but I turned around within the first 10 metres of climbing from the river. Unfortunately it’s one of those tracks that climbs very steeply to first get up onto a spur, and while that in itself seemed normal, it didn’t feel quite right to be going up something like that when on my own, particularly when I was already feeling my sore knee again, and without knowing exactly how long it’d be like this before the gradient shallowed out and became easier. Actually given the state of my knee and only 3 more hours of daylight, thought of getting down again if I had an accident concerned me too. 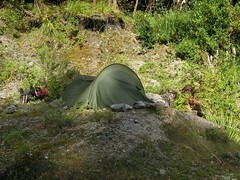 So I turned around, returned to my nominated camping platform, and pitched my fly. I’ll visit Papatahi some other time, perhaps during a proper attempt at a Papatahi Crossing. It wasn’t a terribly well pitched fly in the end given the difficulty in getting pegs into rocks. One day I’ll probably learn and attach some ties to my fly to make it easier to use in this situation (ie. tying it to rocks), but on this occasion I just found some heavy river rocks (sometimes with large and interesting looking spiders underneath) to weigh down the edges. It looked ugly and was probably bad for the canvas, but without much wind it did the job well enough and I wandered out to soak up the last of the sunshine, boil some water and rehydrate my dinner (Yum), and read this book I found by Jane Austen and some other guy. This is the first time in a long time that I’ve been tramping solo and had a night completely alone (without running into other groups). Despite being camped alongside one of the main tramping routes over the Rimutakas, I saw nobody between about 2pm Saturday and 11am Sunday. I’d had an idea in the back of my mind that if I got away early enough on Sunday morning, and felt well enough, I might be able to dash up Mt Matthews on the way home, which I’ve also never done. Things didn’t work out so well though, and despite best intentions and opening my eyes at 6am, I didn’t bother to drag myself properly from my sleeping bag until 2 hours later, and then not getting away until after 9. I’m sure I needed my sleep, though. If there is a track near the river in this region, I think it goes somewhere along the true left (south-eastern side) of the North Boulder Creek and Orongorongo River. In fact, I saw clear evidence of people (or possibly animals) having stumbled and shimmied down the sandy banks in the past. As I was leaving I thought I might investigate to try and find any track, but all I found immediately at the top of the bank was lots of barely penetrable and tangly supplejack, and a solid knee-full of Onga Onga (also known as Stinging Nettle), which regrettably stayed with me for the rest of the day. Maybe a good point is that on the occasions that I thought it stopped stinging, it seemed to be numbing the pain that was around my knee before it… it was probably my imagination, though. So I went back down the creek, more or less the way I came up. There must be reasons to go up the bank, but I’m not completely sure what they are. Perhaps there’s a really good track that I just didn’t look hard enough for. It might sometimes make sense when the river and creeks are flooded, but it seems necessary to cross them so frequently in this area regardless anyway. 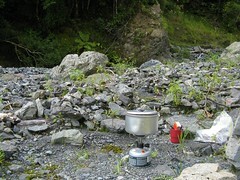 Back along the Orongorongo River, I checked a couple of other places where there were obvious short tracks down the high sand banks, and on one occasion found what was a very nice campsite on the true left. (I tagged it on my GPS so it’s marked it on the map attached to this post.) It’s probably one of many nice campsites in the area, although few would be clearly visible from the riverbed, and if I’d found it the night before I expect I would have come back to here rather than camp on the edge of the river where I’d found myself. On reaching the mouth of Matthews Stream (between Baine Iti Hut and Baines Hut), and still only being mid-morning, I thought I might at least wander up the stream-bed a little to check out what was there, and how easy it is to find the track as it leaves to climb up to South Saddle and Mt Matthews. The LINZ map data actually shows a track that doesn’t go directly along this stream at all, but which enters the trees on the southern side of Baines Hut before criss-crossing Matthews’ Stream further on. Looking for this route seemed obsolete, if it even exists, and there was also a big obvious orange track marking stake in the middle of the wide stream mouth, which I took as a likely sign that walking up the stream-bed was a preferable option. 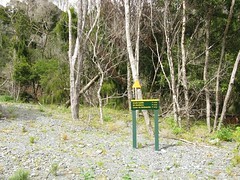 Following it around the corner to be parallel with the Orongorongo for a short stretch, it was barely 10 minutes before I found the well marked and verbally sign-posted beginning of a track up to South Saddle, Mt Matthews or alternatively the coast. It would have been very tempting to try and dash up to see what was there, except for the whole knee issue combined with knowledge of a family function I wanted to attend later on Sunday evening. So I took some photos, enjoyed the silence, and returned to the Orongorongo where I met the first people I’d see all day — a group of about five who were preparing to walk up. I’ll come back and take a look up some other time. I made a token effort to find the walking track inside the trees on the true right of the Orongorongo River, which supposedly begins about here. I wasn’t successful, though, so continued to follow the river bed until I saw a dark green shipping container balanced in the trees on the hill-side. It turned out I’d reached Haurangi Hut, another of the locked DOC huts in the valley and similar in status to Shamrock Hut where I’d visited yesterday. I wandered up for a look, and for future reference, before leaving at about 11.20am. From this point on, what remained was a nice, casual river walk, albeit careful given I didn’t want to do myself any more damage. I stopped for a brief lunch as I reached the end of the Orongorongo Track after another hour, before finally leaving the river. The track wasn’t quite so hard on the way back for the final hour, and I’m unsure if it was to do with walking the opposite direction, or perhaps my various leg muscles had this time been warmed up in advance. Or perhaps my knee’s just getting better as time goes on. I was just happy that I managed to get out and do something for the weekend, and also that I finally was able to see another side of this mountain range which, until now, my impressions have been biased with ideas of built-up private batches everywhere, and vehicle access. I think returning some time to explore more of it will be an easy decision. 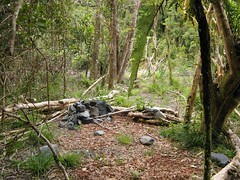 This entry was posted in tramping and tagged bagged:baine iti hut, bagged:haurangi hut, bagged:shamrock hut, independent trip, rimutakas, tramping. Bookmark the permalink. You made the right call not going up Mt Matthews with an iffy knee. I went up the Mt about 4 weeks ago and it is quite steep in places. I started the day from Catchpool when the gates opened and it was a full day up and back. The views from the South Saddle are spectacular (there is also Onga onga up there – around eastern parts of the perimeter of the grassy knoll on the saddle). 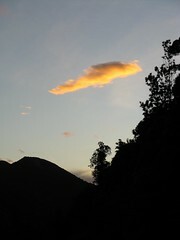 Funny thing – I didn’t think I’d have company while going up the mountain. Was about 3/4 of the way up and stopped for a coffee when I heard voices and was overtaken by two middle-aged ladies who were climbing at great speed (well – relative to mine). Have found the river valley quite fun to tramp on – both north and south of hump bridge. Enjoyed reading your trip. Hope your knee recovers soon. Thanks Phil. I definitely intend to go back, perhaps early next year if things allow. My knee seems to be slowly repairing itself, and I’m really hoping it’s good to go by new year as I’m planning to go south for a week or so. I’ve noticed there’s quite a lot of Onga Onga in the Orongorongas as soon as you get away from the rivers major tracks, and also in the Aorangis further to the east. Actually I’ve even come across some in parts of Belmont Regional Park in Wellington, which is largely farmland (at least the the part where I was). Maybe it’s something about the latitude. Thanks for the info in your Orongorongo posting. I completed a Papatahi crossing at the weekend and (thanks to your GPS tagging) I was able to locate the campsite beside the Orongorongo River for Saturday night. Just as well because there was really nowhere else to camp that I could see. 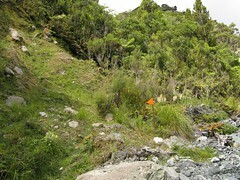 It was very steep for quite some time up the Papatahi track – DOC has even placed a rope in one place. Great trip, althhough lots of Onga Onga on the way out to Onoke on the Wairarapa side. Took me 3.5 hours to campsite and 9 hours the next day (including a couple of long stops for a brew on top and lunch at the Wharepapa hut) to get out to the Onoke carpark. G’day Lee. That’s great to hear one of my GPX files has actually been useful for someone. I take it you meant the campsite above the river (true left), rather than that place on the river-bed where I actually camped? The latter could well be washed away by now. I really just started keeping GPX files for myself when I couldn’t avoid losing a map for long enough to make it at all useful to start drawing lines over one. I live at the house (assigned to the ranger) near the entrence to catchpool valley. As the rangers son I love to hear feed back on the valley even though its not my website. I also love those pictures Mike.